When looking for a new Lake Havasu home, visit as many open houses as you can. Putting your wish list together looks great on paper. However, seeing fixtures and features in person might change your mind about some things you thought you were dead set on. 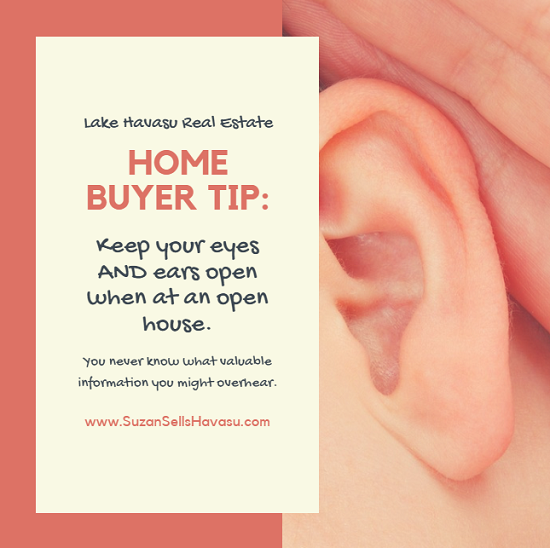 While you're at an open house, keep your eyes and ears open. You might overhear some valuable information you can use to your advantage later. Even in a seller's market like the one we have going on in Lake Havasu, the list price isn't necessarily the sale price. If you overhear the agent tell someone that the owners are "flexible", that means they're willing to entertain offers at less than asking. However, you don't want to insult a seller by presenting a lowball offer. So, talk to your agent first. Are people talking about a funky odor or visible stains during the open house? Did they see signs of rodents or other creepy crawlies? If you do decide to put in an offer, make sure these get a closer look during the home inspection. Sometimes, the problem may be too expensive to undertake. That's when you might want to opt to walk away. Oftentimes, neighbors come to open houses out of simple curiosity. A home is really only as good as the neighborhood it sits in. These neighbors can provide valuable insight into what's going on in the community around you. Traffic. Crime. New construction taking place nearby. Schools. You never know what bit of information you can use when it comes time to negotiate a sale price. So, pay attention. Ask questions, too, if you feel so inclined. If you hear "that price is way too high" more than once at an open house, make a note of it. Then, talk to your real estate agent to find out what neighboring homes recently sold for. 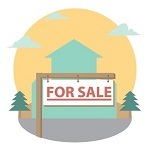 Make sure your offer reflects current market trends. "This is the perfect location for my big screen TV!" When other buyers at the open house talk about where to place furniture, then you know you've got competition. If you see yourself watching Sunday football in this particular Havasu home, put in an offer as soon as possible. You don't want to wait and miss out. In particular, the words "foreclosure", "divorce" and "death" should make your ears prick up. This could signal that the seller is really motivated to get this property off their hands. They might even be willing to sell for less in order to move on. That could work to your advantage. Don't just go by what some strangers say, though. Always discuss whatever you overhear at an open house with your Lake Havasu real estate agent. They can help you decide how to proceed when you find the right property. They'll also dig deeper into whatever issues or information you found out during the open house. Contact me when you're ready to buy a Lake Havasu home.